Is your system infected with malware and you are not able to get rid of it. Malware create lots of trouble and some also disable security software. So, most of the people recommend use of live CD containing anti malware application to clean malware from the system. BUt some other useful software also available which terminates the malware. RKill is a similar software developed by BleepingComputer.com. It terminates known malware processes. So that your security software can clean your computer. RKill is a very small software and available for free. Download RKill from official website. Don’t think it as a malware removal tool. It is used along with your existing anti-malware or antivirus tool. This tool does not need any installation. Just download and run. When you run the too, it checked all running processes and try to find the malware processes. If it finds any malware process, it forcefully terminates it and remove the registry entry which is preventing your security program from working in your system. 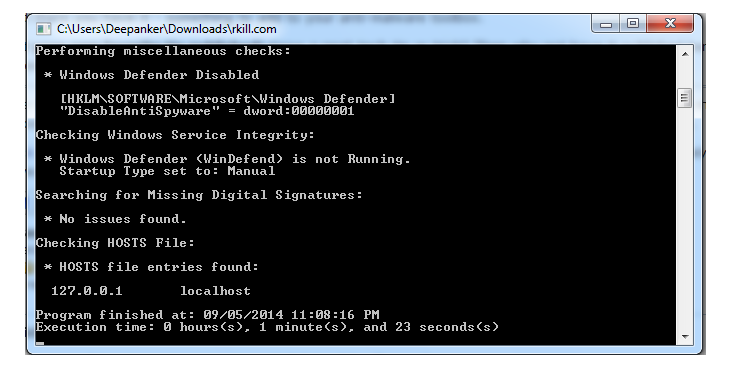 Once it has finished its working, it will show you a message to start your security program and check Rkill’s log file. It is really a nice tool and must have for Windows user. If you think that your system is suffering because of Malware, you can try this.